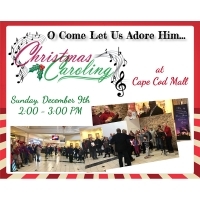 Let's join other local churches in celebrating Christ in Christmas by singing Christmas carols at the Cape Cod Mall! We'll meet at the inside entrance to the Women's Department of Macy's at 1:30. Then we'll join the other folks from local churches to sing and celebrate Jesus! If you have questions please ask.